NASA's Hubble Space Telescope captured a stunning image of the central neutron star of the Crab Nebula, which spins at a rate of 30 times per second with a visible pulsating appearance, much like a heart. A detailed image of the core of the famous Crab Nebula, captured by NASA's Hubble Space Telescope, reveals the "beating heart" that, with every pulse, breathes life into the expanding cloud of gas and debris surrounding it. Located 6,500 light-years from Earth in the constellation Taurus (The Bull), the Crab Nebula formed via a supernova explosion — the death of a massive star. At the center of the Crab Nebula is what's left of that dead behemoth — a superdense neutron star that spins at a rate of 30 times per second, spewing beams of radiation and particles into the cloud of gas and debris that surrounds it. Although this neutron star contains roughly the same mass as our sun, it's extremely small and dense, with a diameter that's just a few miles across. Such fast-spinning neutron stars are called pulsars: as they rotate and radiate, they look as though they're pulsating from our perspective here on Earth, much like actual "beating hearts." The Crab Nebula is one of the most studied and photographed objects in space. 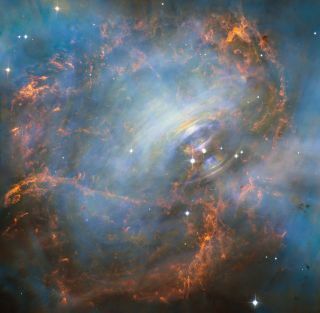 While many images of the Crab Nebula highlight the colorful filaments visible in the feature's outer regions, the latest Hubble images show the inner workings of the nebula, according to a statement from the European Space Agency. In the newly released photo, the neutron star is the righthand of the two bright stars that are seen near the center. Swirling bright-red filaments of gas are expanding outward from the two bright spheres, traveling at half the speed of light. "The neutron star is a showcase for extreme physical processes and unimaginable cosmic violence," NASA officials said in the statement. "It is thought that these wisps originate from a shock wave that turns the high-speed wind from the neutron star into extremely energetic particles." The new Hubble photo of the Crab Nebula is actually a composite of multiple images that were taken over a period of 10 years to illustrate the spinning movement of the neutron star.